Shows animated weather for 3 days including hi and Lo temps. Tap center of hands to make them temporarily. Tap 9 oclock- To cycle through 4 levels of additional dark filters. 4th Tap is complete darkness Theater Mode. Tap 6 for ambient options. Tap 3 to choose between TEMPERATURE, STOP WATCH, STEP COUNTER. Tap Start and Reset to operate stopwatch. 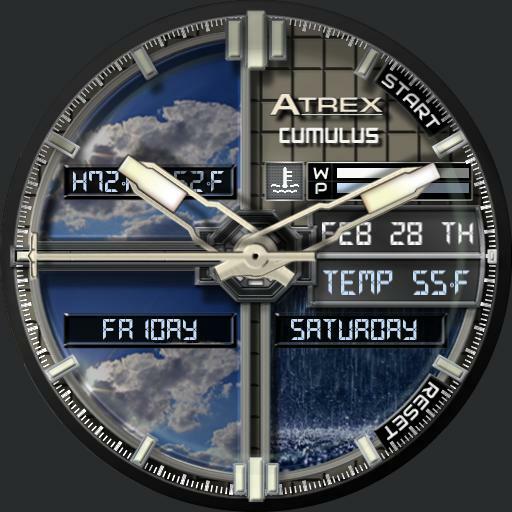 Tap upper left display to update weather. Shows, Month, date, day phone and battery levels.